Hello everyone. I have some good news. I think I've finally been noticed as a blogger. I've been blogging since October, 2007 - so that's almost a year, so I'm very excited. I have to admit I haven't been faithful in posting so that probably has something to do with it. In any event, glad to see some of you on board. I hope you'll come back often and maybe even post something. Maybe I'll offer a gift for a card challenge. Keep checking back often and maybe I'll start that in September or early October - once my monthly meetings start back up. The "friend" rub on is a Stampin' Up rub on and on the "i" in Friend and the flower centers, I put a crystal in the center to give it a little bling. I made several different versions of this card and then I dove into making a birthday card for my sister-in-law who turns 50 on Monday. I wanted to use Stampin' Up's "Mark The Date" stamp set. See the card below. The background pink paper is from the Level 3 hostess set and the stripe on the side is the reverse of the brown dot on the chipboard flower. The blue scallop (using the new Stampin' Up scallop border punch) is punched in Baja Blue CS and the little fringe is from the dollar bin at JoAnn's. This turned out so incredibly cute. I don't have a stamp set that has all of the months, and so I just went to my computer and typed in the month of August. You'll see in the next card I post that I also made another one for August using fall colors and a September one using fall colors. First I measured the calendar across and it was 3". So I set my margins at .5 on the left and I believe 5" on the R. You'll have to double check that when you get out of that, look on your ruler on the top and see what your right margin is. Type augst and make sure the "t" in August doesn't go past the 3" mark - if it doesn't print it up. I had to hand write the dates in the calendar too. There's probably a way to format that on your computer too but I didn't have the time to figure it out. So here are the other 2 I made with a Fall theme. The thing I did different with these 2 cards, other than the color, is I wanted to make these generic, so whoever purchased this card from me could put the little circle wherever they wanted it to be. So after I printed up the calendar, I attached it to a sheet of magnet and cut it out - I believe that measurement is 3x3-1/4". I then found out that you can punch magnet sheets with punches and so first I used my 1/2" circle punch to make the inside hole and then I punched over that using my 3/4" circle punch to create the little ring. I did the same thing with patterned card stock on the one and then just used 2 way glue pen to adhere it to the magnet. Now whoever sends it out can put the magnetic ring over whatever birth date "their" friend's is. I thought that was pretty clever. You could also use flat metal washers from your husband's tool drawer as the rings if you don't have these punches. The only thing I did that I would suggest you do differently if you case the card is: instead of printing the month on white cardstock (which is what I did), I would print it up right onto copy paper. That way you may have a stronger hold with your magnet. I think the cardstock is a little too thick and the magnet ring I made doesn't stay in place because it's not making a great connection. Also as a side note: magnets have a right and wrong side. So you may want to punch your little ring out first and make sure it sticks to the right side before attaching your calendar to it. Well until next time. I hope you'll leave me some feedback and let me know what you think or want you'd like to see. I love to see a fall creation you've come up with. I'll post it on my blog for everyone to see - so don't be intimidated. All of my customers are great students and I know if you believe in yourself you'll be proud to show off one of your creations - this is a great place to start. Here's the 2nd card I made that I mentioned below. I just love textured cardstock. It adds such a neat dimension to cards. I found a sheet of these "girly drink" expoxy stickers that I thought I would use on this "baby" card instead of the chipboard chick that the kit said I should use. 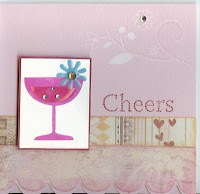 I also used the word "Cheers" which is a Stampin' Up stamp from the "Snowflake Spot" set which was in the last catalog but is now discontinued. I also added a little rub-on I had sitting on my table and put a little rhinestone in it to coordinate with the rhinestones in the pink glass. I'm sure a girlfriend of mine would love to get this for her birthday. What do you think? Alright so this is one of the cards I made that I mentioned below using the Basic Grey baby card kit. This is from the Sugar Coated line. How cute is this? 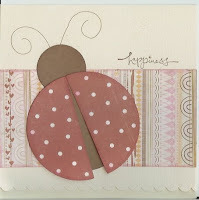 The card base is a cream card and the die cuts are a large and small brown circle for the ladybug body and then a large polka dotted circle for the wings. The wings have a dimensional on the end. The word "happiness" is from "Warm Words" a Stampin' Up stamp. I used Stickles "diamond" on each of the dots on the wings. So I guess I didn't realize that blogging was all about a daily journal. But what a neat idea. Up until now, I've just been posting cards I've been making, which if you find my blog is probably what you're looking for anyway. So I decided to try to start blogging more about my life and how I come about inspiration and share my ideas with you. What a beautiful weekend we had - it was hard to be inside at all. However, my DH had a Brewer's game he was going to on Saturday night with the guys so I couldn't wait to have a night to play in my craft room. Unfortunately we just purchased an HD TV - 40" so I also wanted to have some time to watch my kinda TV on the big screen. Know what I mean. But I did manage to make a few cards and I finalized my nieces squash book I made for her so I could get that in the mail and surprise her. Anyway, a week or so ago, Terry and Georgette - a couple of co-workers/friends of mine, headed to Stamper's Cupboard in Mukwonago over our lunch hour. I purchased two card kits from Basic Grey - which by the way I didn't know Basic Grey had. One kit was for girl/boy baby cards using their sugar coated and archaic cardstock line. The other one is all birthday cards using their cupcake line. Since I don't have a lot of people around me having babies (I'm not sharing my age with you), I decided to take the baby card kit and incorporate my own ideas into it - mostly because both the boy and girl cards came with chipboard and they were baby related and/or dinosaur related. Gotta say I LOVE the chipboard dinosaurs. If you have boys - you've gotta get it. So as soon as I get a minute, I'll scan and post the few cards I made using the kits - so stay tuned and watch my blog for them. Other than that - it was so gorgeous outside, we spent the whole afternoon Sunday outside playing in the yard/garden. I hope you all had a beautiful weekend. Be sure to email me with your thoughts and ideas. I'd love to hear from you. I'd like to ask anyone out there if they're going to Scrapfest in KC? I'm going with my sister and we can't wait. We each have 3 classes we're taking on Friday and Saturday. I know it will be here before we know it. Talk to you all tomorrow - maybe. I can see this blogging/journaling thing could consume 100% of my time - even 50% of which I don't have. 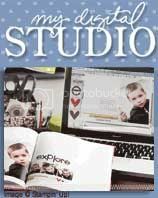 Take my survey, I'd love to hear what you like to do - scrapbook or make cards? 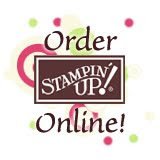 One final note - do any of you like Stampin'Up and/or have the new catalog? 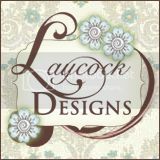 If not and you like Stampin' Up you've got to get it - it's to die for. All those fabulous ideas. I need to quit my day job and do that.